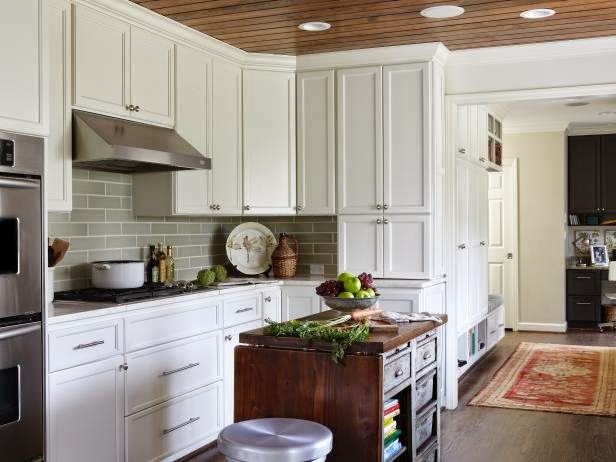 Get tips on how to find the right cabinetry for your remodel. Cabinets form the backbone of the kitchen. Configure the cabinetry to make the most use of your kitchen’s size and floor plan. Consider different layouts and looks. away from doors and toward drawers. Drawers make storage more accessible for more people. "Ergonomically, it brings contents to you rather than you having to bend over and dig through layers to get what you need," says Dennis Poteat of Blum Inc.. Hardware accessories neatly organize plates, pots, pans and lids, plastic-ware, you name it. As for materials, Brad Burgin, president, California-based Burgin Construction, says “no one wants particle board.” And no one wants melamine, which is basically particle board with a coating. Plywood is preferred and it doesn’t off-gas from coatings. “Getting cabinets made out of plywood is a good move for resale here in California,” he adds, noting the durability and longevity of this material. Style. 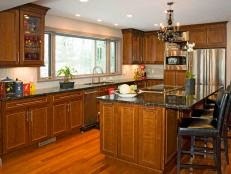 Cherry wood is big for cabinets with rich, dark finishes. For a more exotic look, go for alternative woods such as mahogany, bamboo, sapele and anaglade. These can be stained or even lacquered to provide a sleek finish (show image). The glazed cabinet treatment is phasing out with the rise of textured looks: wood grain peeking through brushed finishes—a more natural look. Function. European-style frameless cabinets afford more storage than traditional rail-style cabinets that are typically found in U.S. kitchens. 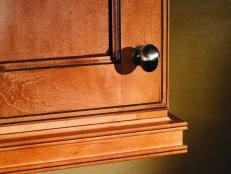 Soft-close on drawers and doors is a must. Some hinges have this feature built-in, but it’s an add-on cost for other models—about $5 retail, according to Burgin, adding up to $350 to $500 for an entire kitchen, depending on size. 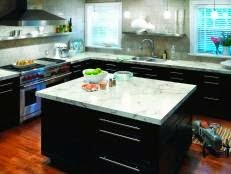 Touchless cabinets are a luxury add-on that Poteat thinks will move into the mainstream before long. This application is especially convenient for waste/recycling drawers. Hardware. Don’t forget about hardware. It’s the jewelry of your kitchen. Request fully adjustable door hardware that allows the installer to adjust doors so the gap between them is uniform. 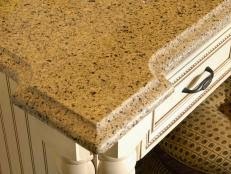 Also ask for recessed bottoms or a valence to hide under-cabinet light fixtures. You don’t have to invest in luxury cabinets to get high-quality features. 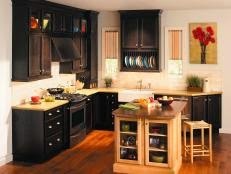 Moderately priced, semi-custom cabinets offer many organization solutions like spice organizers and pull-out pantries. 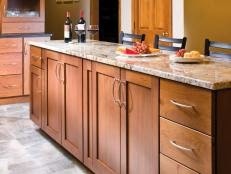 What are you going to do with that dead space in the far back corner of your cabinets? You might not even know this space exists—sometimes the blind corner is closed off completely. A pie-corner base cabinet pulls out and utilizes the space; and an old-fashioned Lazy Susan spins and brings stored items within reach.